If you see him on the street, don't ask Nisse Greenberg how he's doing. He'll give you a 60-minute multi media presentation on why he is the way he is at that very moment. Or maybe that’s exactly what you’re waiting for. 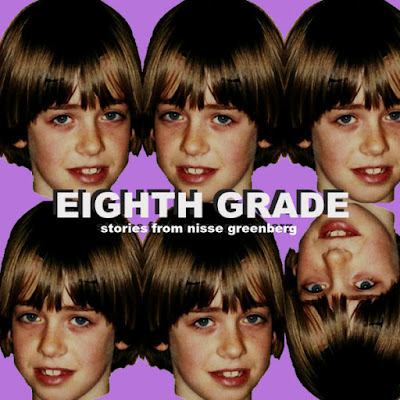 In Nisse Greenberg’s Eighth Grade, Greenberg shares a tale of how being a bottom dweller on the social ladder of eighth grade aided in the neuroses he has today. With a visual aid that brings you back to the 90s, Eighth Grade is a tragicomedy of sorts. Greenberg offers a sheepish personality to narrate and chronicle life in Maine with his gamer buddies and the newfound desire for the ladies. No matter your place on the social hierarchy of middle school, there’s something within Eighth Grade that you can easily relate to. As far as how Greenberg crafts his monologue, it’s a bit static. There’s some logical time and theme jumps but there is the occasional backtracking that occurs causing missed beats. What could easily be a typical monologue play, Greenberg adds a 90s inspired slide show. It’s kitschy and perfect, harkening back to yearbooks and video games of yore. No one said middle school was easy. Nisse Greenberg finds humor in a terrible time of his life. Eighth Grade may take you back and remind you of your own middle school experience. But being able to poke fun at the past opens up opportunity for the future.